The Thermo Revco Combination Refrigerator Freezer offers you space saving storage of samples and consumables ideal for basic everyday lab use. This freezer refrigerator combo unit is easy to clean and has a durable finish for years of use. The Thermo Revco Combination Refrigerator Freezer has a temperature range of -12 to -20°C with 2.5 cu ft of space in the freezer area, while the refrigerator area ranges from 1-10°C with 8.9 cu ft of storage. The Fisher Scientific RCRF192A17 Lab Refrigerator comes with two adjustable shelves in the fridge and a half shelf in the freezer, with and two storage compartments and along with door shelving for added space. This lab refrigerator is controlled through a manual adjust temperature control and should be defrosted manually. 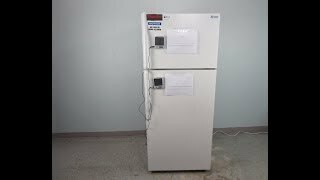 28” x 33" x 68"
This Thermo Revco RCRF192A17 Laboratory Refrigerator and Freezer has been fully inspected and comes with current temperature validations and a clean bill of health. All of our lab equipment comes backed with out standard warranty. Should you have any questions, please don't hesitate to contact us.